Two million strands of lights, 300 miles of garlands and bead strings adorning over 1,800 shopping centers, resorts, cities and commercial properties—since 1953, The Becker Group has invoked its special magic throughout the United States and more than 25 other nations around the world, transforming unique locations into virtual holiday wonderlands. Regardless of the region, regardless of the venue, regardless of the budget, The Becker Group exceeds its clients’ greatest expectations while nourishing the holiday spirit. Our environments foster the spectacular experience you choose for your visitors: warm and welcoming, charming and nostalgic, enchanting and bedazzling. The Becker Group thrives on tradition, yet we revel in delivering the unique and innovative, pushing the possibilities and creating one-of-a-kind designs. We also understand unlimited budgets are simply not available to all of our clients. That’s why we have developed an entire line of Becker-exclusive, modestly priced sets and themed tower trees that can be inexpensively customized to match your budget and space. Our catalog is simply the starting point. Email us at Sales@beckergroup.com to begin the conversation. The Becker team makes it all happen for you! Our display specialists and customer service representatives are always on call to keep your space fresh and exciting. Our creative directors and artists weave your ideas into brilliant tapestries of color and festive experiential displays. Our project managers are the best in the business, planning and advising, ensuring the process is fun and easy, hearing our clients’ needs and then executing them from conception through to Santa’s arrival. Thank you for the past 60 years! Your loyalty inspires us to continue to build our creative treasure trove. Before we create anything, though, we listen to you, our treasured clients. Call us today at 1-800-999-1830 to explore the possibilities. 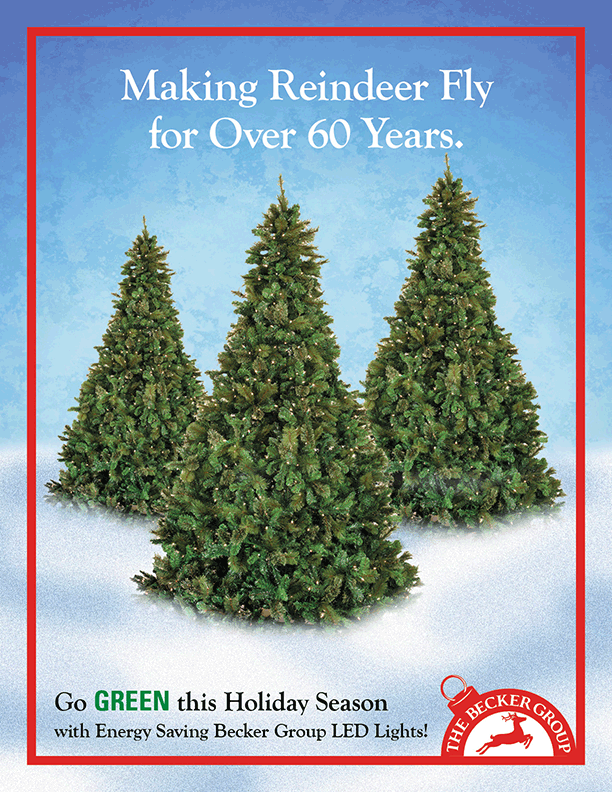 We’ve been making reindeer fly for more than 60 years, and are looking forward to sending them your way for many years to come!